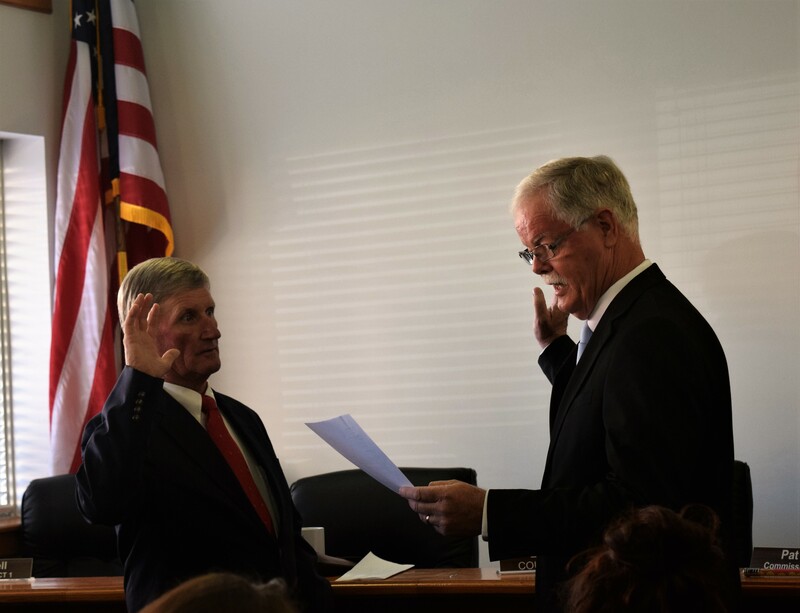 HOUSTON COUNTY – In his last official act as county judge, Erin Ford said goodbye to his elected position and administered the oath of office to his recently appointed successor, Jim Lovell. The swearing-in ceremony was necessitated after Ford announced his intention to retire in late October, with an effective date of Nov. 22. 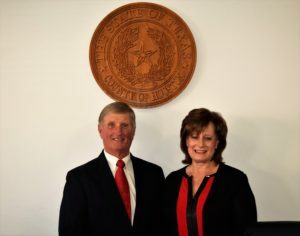 After the matter was tabled during the Nov. 8 meeting of the Commissioners Court of Houston County, the deliberations resumed during the Nov. 22 court session at which time Lovell was appointed to serve as Houston County’s newest county judge. 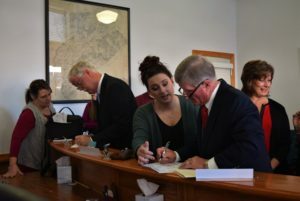 The swearing-in ceremony began at 10 a.m. on Thursday, Dec. 1 as Ford welcomed a capacity crowd to the commissioners’ courtroom. The outgoing judge expressed his appreciation and gratitude to all he worked with during his tenure in office. “You have become friends and colleagues and I will miss y’all. I especially want to thank Jan Pigford for putting up with me for four years, not to mention several other people,” he added with a laugh. Following the invocation and pledges to both the American and Texas flags, Ford began to administer the various oaths required to become county judge. Once the oaths had been administered, County Judge Jim Lovell was greeted by a round of applause from the courtroom gallery. As the applause subsided, Lovell remarked on his lengthy friendship with his predecessor and recalled when Ford was first elected to office in 2012. “I thought that was the best thing that ever happened to Houston County. I stand with that now. I know he is respected and I know he has done a lot for this county. I want you to know this county appreciates what you have done,” Lovell said. Lovell explained when he was first approached about accepting the role of county judge, it was unexpected and his decision to accept the a ppointment was not taken lightly. The newly – appointed county judge indicated while he didn’t have a lot of experience in county government, his family had a legacy of public service at both the county and state levels. Lovell explained his grandfather had served as both the sheriff and county judge of Houston County, while his dad had served as a member of the Texas House of Representatives. “I’m looking forward to learning everything I can. We have a great commissioners court in place and I’m looking forward to working with these gentleman to serve our county. I just ask that your support and prayers be with me as we try and make this an even better place to live,” Lovell said.